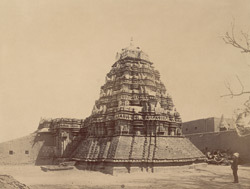 Photograph of the Galageshvara Shiva Temple at Galaganath, taken by Henry Cousens in the 1880s. This large temple faces east and is situated along the Tungabhadra river. It consists of a shrine, a closed hall, preceded by an open hall. An unusual pyramidal basement, which was probably built due to problems with instability during construction, surrounds the shrine. The tower is decorated with plain architectural elements while the wall panels of the back of the hall have some fine decorations. A large inscription slab was found in the open hall. It dates from AD 1080 and records a grant to the god Galageshvara. The date gives an indication of the era when the temple was built. On the exterior, figural decoration is only found on the panels at the back of the hall although the interior has numerous niches containing figural sculpture.